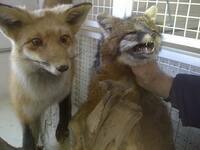 A grey fox - a rare species for Quebec, pictured (right) - was trapped in Lac Megantic in December. The trap was meant for a coyote. CBC's Alison Brunette went out on those traplines, and brings us a look into whether trapping should be allowed if hunters can't control which animals are killed.